New Earth is like a song that has not been sung—a totally new sound in Creation. A song with a sound of hope. When earth changes from one garment to the next, some harmony and harmonic will be set within the Universal scale of music—you could say, that is of a new key. It is like this—a song will be born. And to carry its new structure of notes—a higher pitch will come to the song. The voices of the group consciousness who carry the tune of this song are and will be so sweet—it is astounding, magnificent in harmony and ringing with possibility. This song is a hymn of balance, an ode to unity, a ballad of perfection—a rhyme in the Rhythm of Joy, of ecstasy, of contentment not known on Earth. This song will fill Creation even as it mixes with galactic and universal songs also reaching into higher frequencies of mirth, of beauty, purpose and Love’s union. Happy is the heart who listens to such a song. Happy are those who will sing the song and who will sing of the song—carrying its message of Promise and Hope elsewhere in existence. 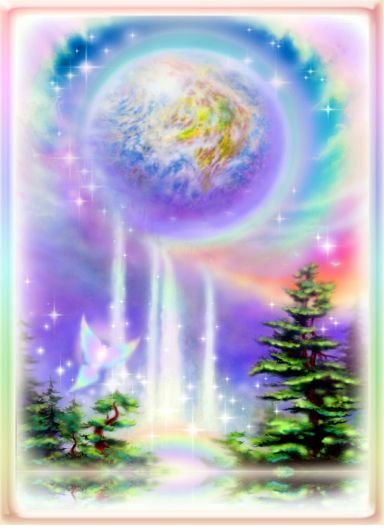 When the auras of Planet Earth as she is now populated and The New Earth Planet preparing for continued population touched—there was a song of Sheer Excitement, a ripple of Hope—a beautiful first kiss saluting a union we have been watching and waiting for. Each touch of auras and each time this occurs in the Universe it is again a magnificent first embrace that opens the heart of wonder. May the hope of this Union carry hope and love into every heart in each of you who will pass through the transition now coming into bloom in your lives. May you rejoice in your heart as your soul and spirit convey to the rest of you—that which you have awaited is around the corner now. It is Truly Begun.